More than 20 years ago on the dry river valley of the Taban river, which appears to be the natural border between the municipalities of Kainardja and Alfatar in the district of Silistra, a curious rock cult complex has been registered. It includes rock sactuaries, alters, cult platforms along 4 km of the shores of the ancient river Taban (Malak Kanagiol) in the region of the villages Strelkovo, Vasil Levski, Pop Rusanovo and Kutlovitsa, region Silistra. 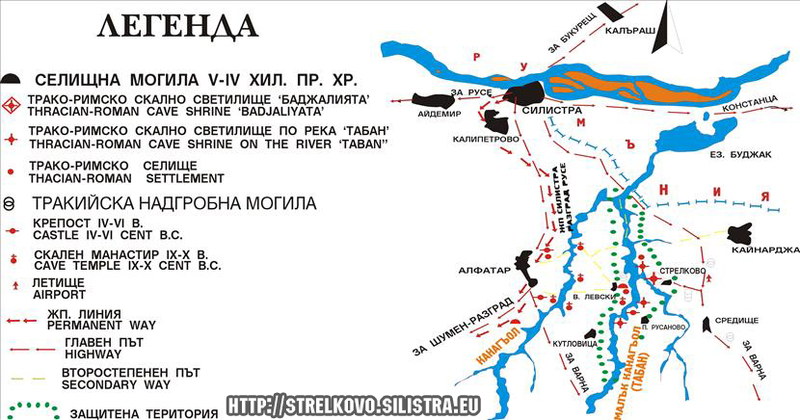 The river valley Taban(Malak Kanagiol) begins in the Forbolkan and crosses the Dobrudja steppe from the South to the North.Not far from Silistra it joins with the river Kanagiol afterwards it flows into the Danube river through the lake Garlitsa (Budjak) on the territory of Romania. The ancient rivers, which have run dry in the end of the XVIII century have cut deeply into the limestone’s of the valley and have made beautiful canyons, caves and rock pictures. These phenomena of the nature challenge the curiosity of the inhabitants of Danube Dobrudja from the ancient times. The Tracian-goths, which have been in the area around the VI-V century B.C.are definitely impressed by the nature landmarks on the river Taban and include them in an unique way in their religion. Then chose for a center of theircult practices the most significant rock phenomena in the region-the 20m.high rock crown on the eastern slave of the river Taban near the village Strelkovo, mrn. Kainardja, com. Silistra. On this place the dry river valley makes a deep valley between the hills, surrounded by rocks, in which the nature has made a lot of caves. The biggest and most impressing among them is “Badjaliyata”. 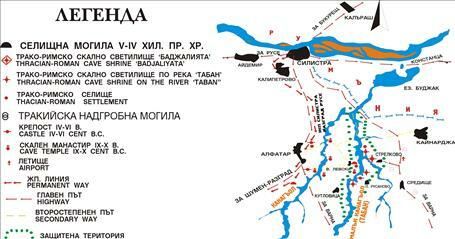 In the summer of 2005 drilling archeological excavations have been made of the most significant of the rock sanctuaries on the Taban, called “Badjaliata”.